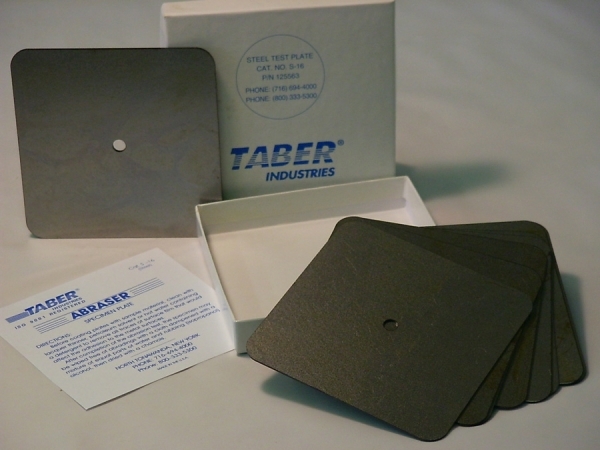 Optional test plates are available for use with the Taber® Abraser (Abrader) and provide a convenient substrate for coatings and other materials. Test panels should be sprayed, drawn down or control-dipped to achieve a uniform coating. Steel (S-16) - Uniformly blanked from 20-gage auto body sheet steel and dull finished for good adhesion of the coating to the metal. 100 mm square with rounded corners and a 6.35 mm center hole. 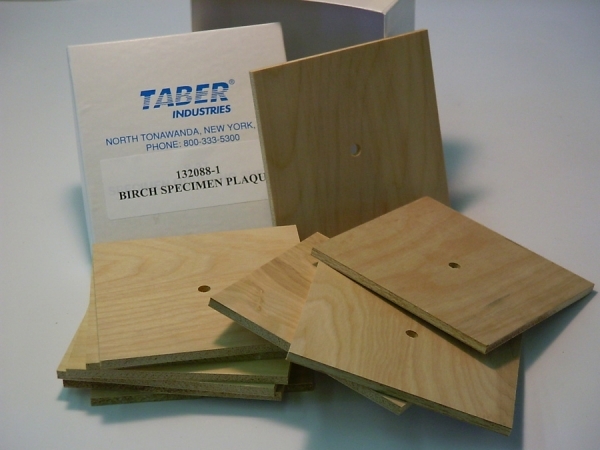 Wood (S-17) - Manufactured from grade A1, 6.35 mm (0.25 inch) birch plywood which has been sanded on both sides. 100 mm square with a 6.35 mm center hole. Aluminum (S-18) - Produced out of #19 gauge 5052 aluminum. 100 mm square with rounded corners and a 6.35 mm center hole. Glass (S-31) - Quality plate glass, approximately 3.15 mm thick. 100 mm square with a 6.35 mm center hole. NOTE: When preparing your own test panels, ensure the sides are flat and parallel. A simple means to check for flatness is to place a straight edge across the test panel surface, and verify there is no gap. Use a file to remove any burrs from the center hole and edges. Zinc (S-34) - Rolled zinc sheet, having a thickness of approximately 0.8 mm. 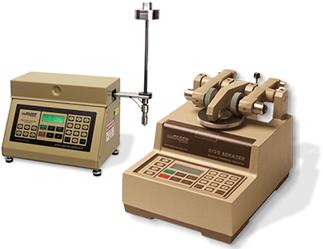 Used to verify the abrasion rate of sandpaper strips such as S-42. Note, the S-34 zinc plate should not be used for more than 10 calibrations per side. 100 mm square with a 6.35 mm center hole. Plexiglas (S-38) - Cell-cast acrylic used to evaluate the abrasion characteristics of grit used with the Taber Grit Feeder Attachment. 100 mm square with a 6.35 mm center hole and protective sheet applied to both sides.